Now that the temperatures are beginning to rise and we are able to peel off a few layers, we can come out of our winter style hibernation and get back to dressing with a little more flair. Winter jackets, wet weather, and frigid temperatures can restrict your wardrobe choices. But spring has sprung and we're ready to show off our duds. No more sacrificing fashion for warmth. Last fall we saw a surplus of designers showing suits on the runways for their Spring/Summer 2018 collections and the time is finally here to rock them! At shows like Teatum Jones and Acne, pastels resurfaced and stole the show. For others, like Tom Ford and Prabul Gurung, the bolder the color the better. What all designers had in common were monochromatic looks. Street-style stars are all aboard this monochromatic train too. 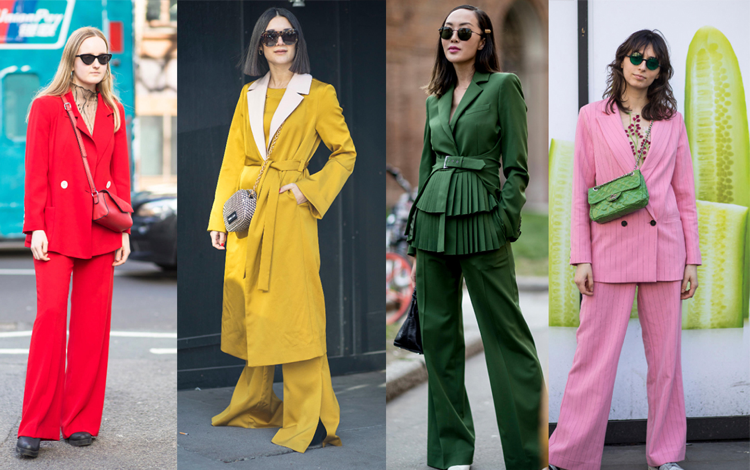 At the London and Milan Fashion Weeks these past few weeks, the most fashionable women rocked same hue ensembles. You couldn't attend a show without spotting at least 5 fashionistas in a pantsuit. Red was a hugely popular color, along with yellows and mustards. An addition to pastels, spring always sees floral prints making a comeback. While wearing an all-over print may seem daunting for some, it is certainly an on-trend look that will get you noticed. Gucci showed some gorgeous prints for both men and women this season. If flowers and delicate patterns aren't really your thing, animal and plaid are alternative prints to try out that will turn a few heads (in a good way!) The Hadid sisters, as usual, rock this trend flawlessly. Opt for something with color. Ditch the darks until next winter. This season is all about beautiful pastels and bold brights. Go for a slouch fit. As much as we love a perfectly fitted suit, baggy silhouettes are all the rage right now. Widen those pant legs and lengthen that jacket. Did we mention how comfortable you'll be? Add a casual element. Style your suit with a graphic tee or a turtleneck underneath. Also, swap out those stilettos for a flat or even a sneaker. Try out an all over print. Florals for spring are huge, of course. But if you're feeling frisky, a leopard print suit will seriously make an impact. Belt it. With all these oversized suits, there is the possibility that you'll feel like you lose your shape in all the excess fabric. Show off that waistline by adding a belt. Bring the hemline up. Whether you're sporting trousers or a skirt on the bottom, don't be afraid to raise the hem a bit. Show off those ankles and legs. They deserve to come out of hiding after a long winter. So ladies, let's suit up! The spring forecast is calling for suits of all kinds. Ditch the drab winter jacket and add a little color and structure to your wardrobe this season. At The Tailory we make custom suits for men and women in all kinds of styles, fits and colors. You're unique. Your wardrobe should be too.